I just returned from Brazil with five other American students. The 20-day program, A Trip to Brazil, the Birthplace of the First TFP, sponsored by The American Society for the Defense of Tradition, Family and Property — TFP, was incredible! The trip lasted from August 13 until September 3, 2003, and was an excellent mixture of informative lectures and sightseeing. It was also truly remarkable to see a country with a rich Catholic history. Our first stop was the beautiful city of Rio de Janeiro. Here, we stayed at Hotel Novo Mundo. After recovering from our exhaustive flight, we went up Sugar Loaf Mountain, where we witnessed fantastic views of the city. Brazilian plenitude at its best. In Vento Haragano restaurant nobody goes hungry. This all-you-can-eat barbecue serves out an average of six tons of meat a week. 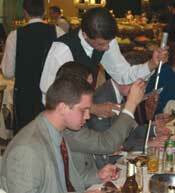 That evening, we all got a real taste of typical Brazilian cuisine at a “Churrascaria,” which is an all-you-can-eat barbecue. The next day, we rose early and went to Corcovado Mountain, where the massive statue of Christ the Redeemer overlooks the city. Then we set off on a ferry ride around the bay of Rio de Janeiro. The bay is surrounded by 7 forts that protected it. We spent the evening touring a Benedictine monastery, where a friendly monk gave us an extended tour. Early the following day, we left for Belo Horizonte, stopping in the small city of Petropolis on the way to visit the 19th century Imperial summer palace of Emperor Pedro II, Brazil’s last monarch. For a moment, we thought we were in Europe, not Brazil. 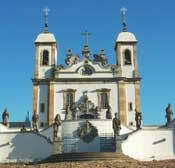 The Church of Bom Jesus, masterpiece of Catholic piety, is embellished with stone-carved statues of the Old Testament prophets by Aleijadinho. Not having hands, he had others attach his tools to his short arms. Our final destination was the huge city of Sao Paulo, birthplace of the first TFP. There, we saw many places associated with the TFP and the life of its founder, Prof. Plinio Corrêa de Olivera. Visiting the headquarters of the Brazilian TFP, known as the Reign of Mary Center, was a highlight. Originally built in the late 1800s, it was one among many magnificent traditional houses in an elite residential neighborhood of the city. Unfortunately, due to rapid and prolific modern demolition and construction, the house is one of the few of its kind still standing. The décor and ambience within this building are strikingly uplifting, in stark contrast to the concrete jungle of skyscrapers nearby. TFP founder, Prof. Plinio Corrêa de Oliveira, found enormous consolation in the prophecy of Our Lady of Fatima, that Her Immaculate Heart would triumph. 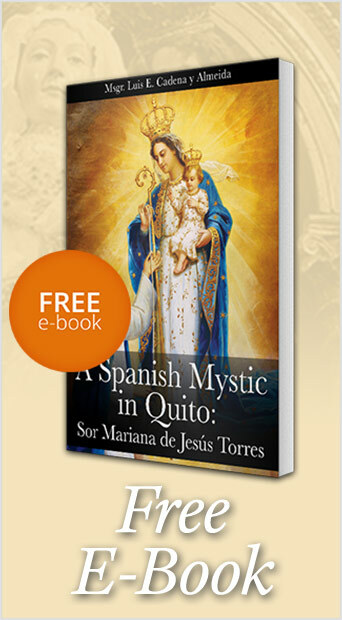 Saint Louis de Montfort talks about a Reign of Mary that would come before the end of time, in which the Catholic Faith and devotion to Mary would spread throughout the whole world. The “philosophy of the gospels” that imbued the Middle Ages, as Pope Leo XIII very aptly described, would again permeate society. Plinio Corrêa de Oliveira wanted a center that would reflect the spirit of this era as best as possible. And to honor these prophecies, this headquarters is called the Reign of Mary Center. Church interior, a beautiful example of colonial architecture. On approaching this magnificent two-story building, one cannot help but notice the enormous grand standard of the TFP on the street corner with the inscription, “Tradition, Family, Property,” overlooking and dominating the intersection. Entering the seat, you will find rooms decorated with fine original portraits, vases, and furniture, and elaborate woodwork. This center not only gives a glimpse of Christian civilization, but also helps to show the true Brazil, unknown to many Americans. This entry was posted in Events of 2003 and tagged 2003, Aleijadinho, Brazil, Catholic, colonial, country, history, people, TFP, trip to by Editor. Bookmark the permalink.